Winter is always a slow time for me to try new recipes. Since I live in Montana, it is hard to get in the mood to go out and crank up the smoker at 40 below zero. So for the last 2 years I have pulled the 5th wheel over to the Oregon coast near where I grew up. I bring along the boat so I can fish and go crabbing. 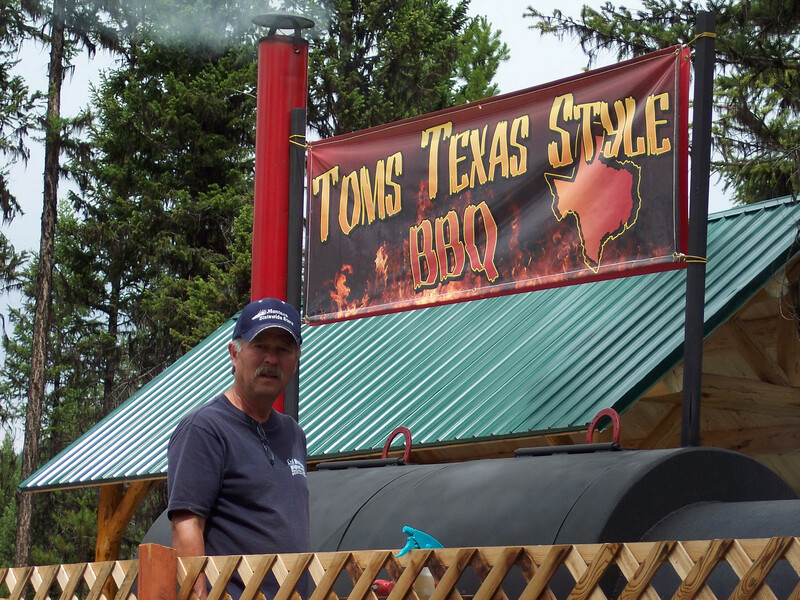 That being said, I have to leave my Texas BBQ pit at home, along with my other smokers. Still not much chance to do anything creative. I try to look for recipes that I can cook on my portable Weber that might rise to the level that is so good, I want to post it to my blog and share with all of you. I found one such recipe the other day. The recipe is for Philippine Pork BBQ . I am a big fan of the Asian influence on BBQ, Korean, Philippine & Chinese. They use a lot of garlic, ginger, soy, fish sauce & citrus. I found this recipe on a blog called EatingClubVancouver.com. They called it Yaya’s Philippine Pork BBQ. 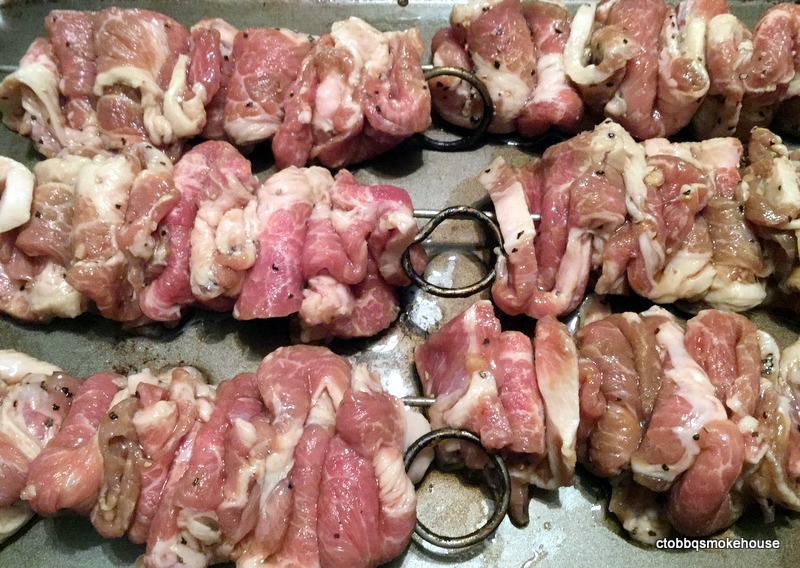 It’s a fairly simple recipe that produces a juicy and flavorful pork skewer. To prepare the marinade combine the garlic, salt, pepper, sugar, 7-up, soy sauce & calamansi* in a bowl and stir to dissolve the sugar. 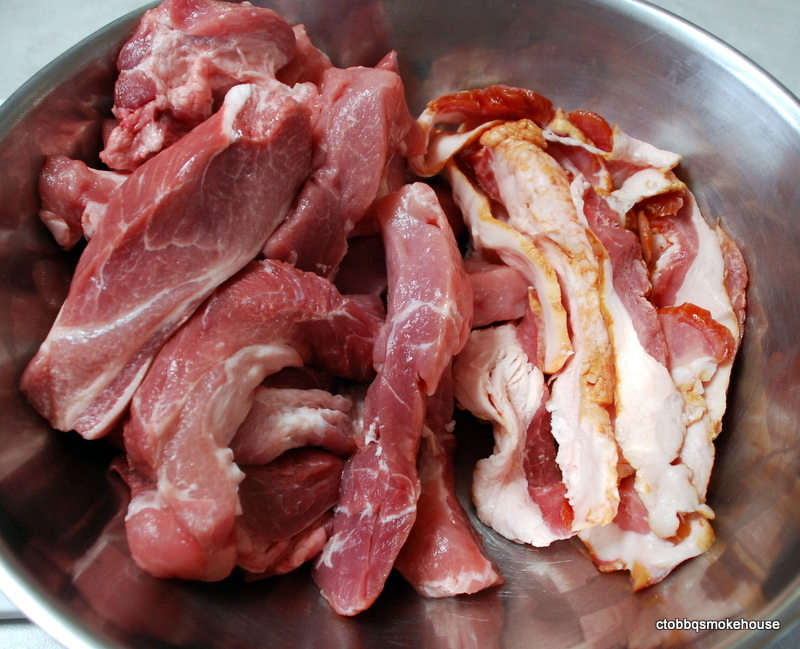 Slice pork shoulder into thin strips. 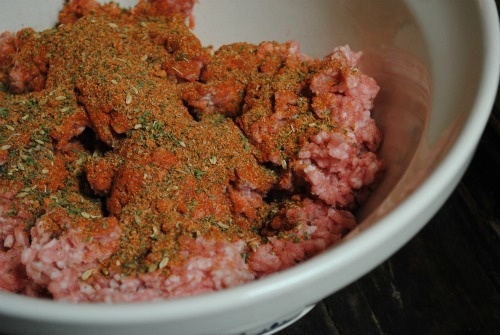 Place in bowl and using your hands make sure all the strips are completely coated with the marinade. * Calamansi is a citrus fruit that is a cross between a Mandarin Orange and a Kumquat. You can substitute orange, lemon, limes, or a combination of them. I used limes. 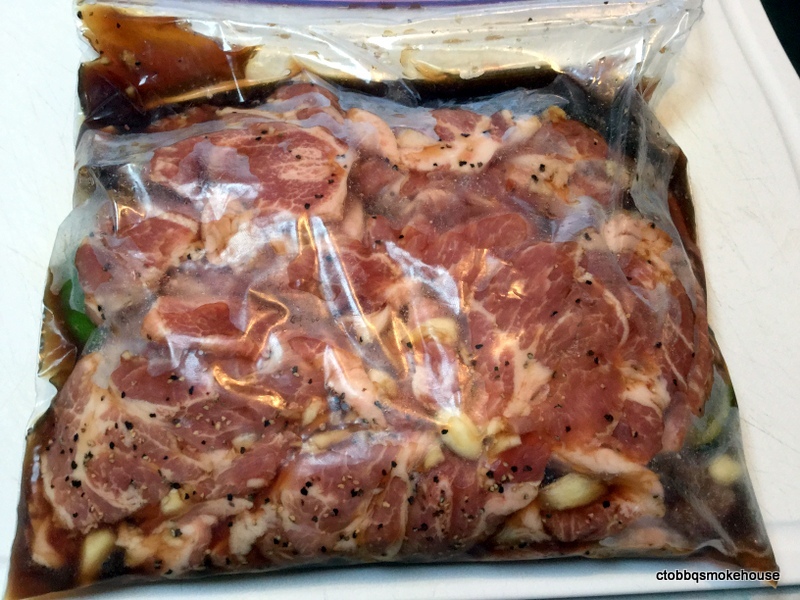 Pour meat and marinade into a Ziplock bag and place in the refrigerator for at least 24 hours and preferably 48. I let mine marinate 60 hours. 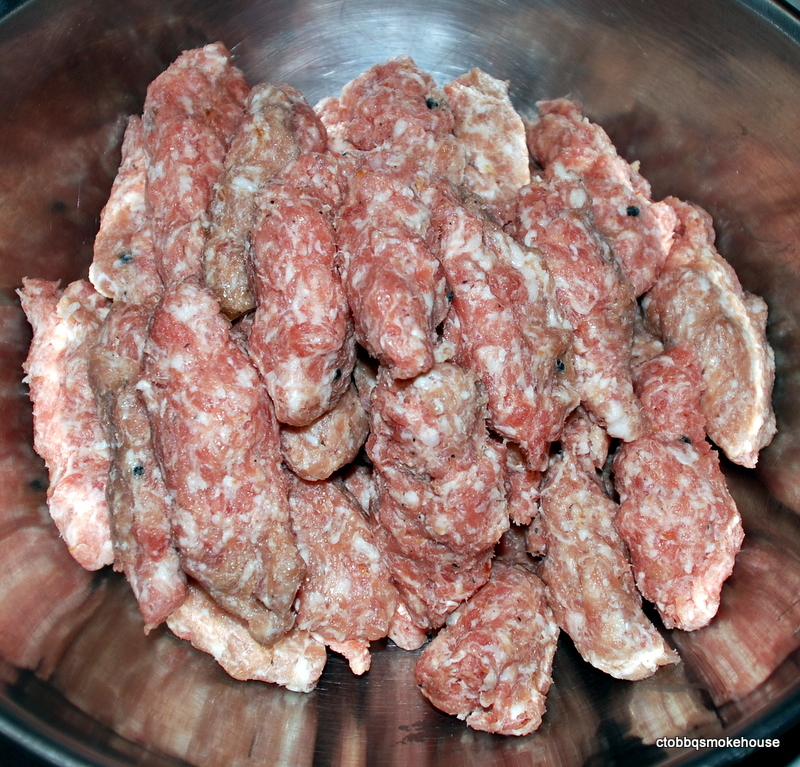 Weave meat onto skewers bunching slices up to produce a full skewer of pork. Cook over medium heat on the grill 3 minutes per side (4 sides per skewer). 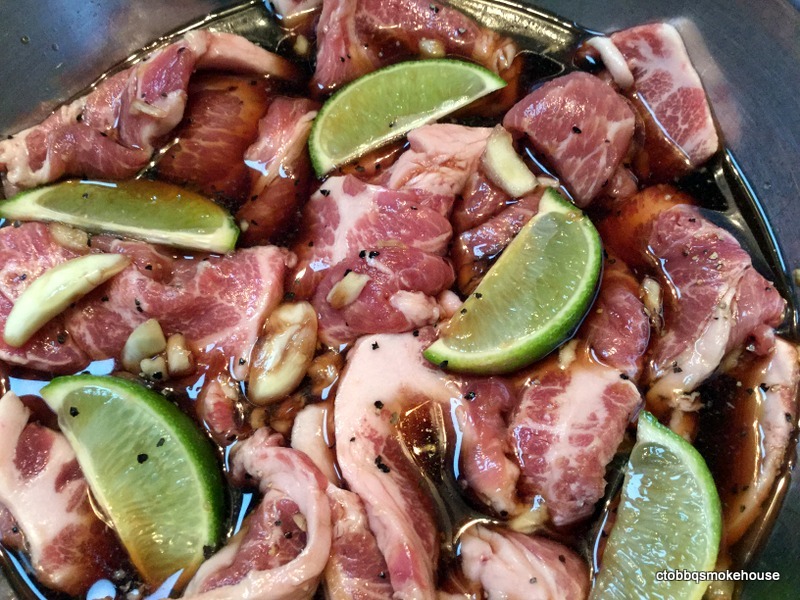 This entry was posted in Grilled, Philippine, Pork, Skewers. 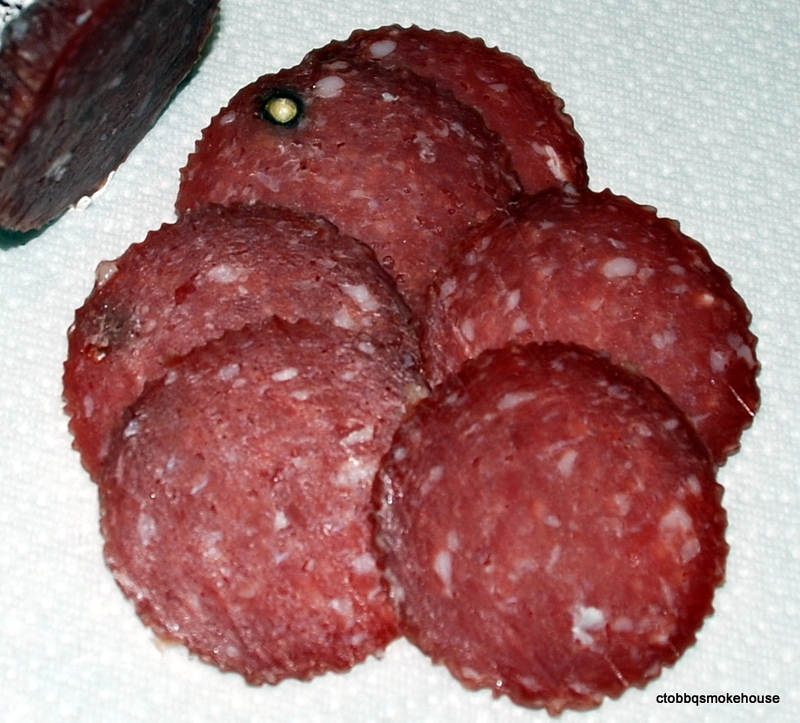 Summer Salami is a popular salami also known as Thuringer. 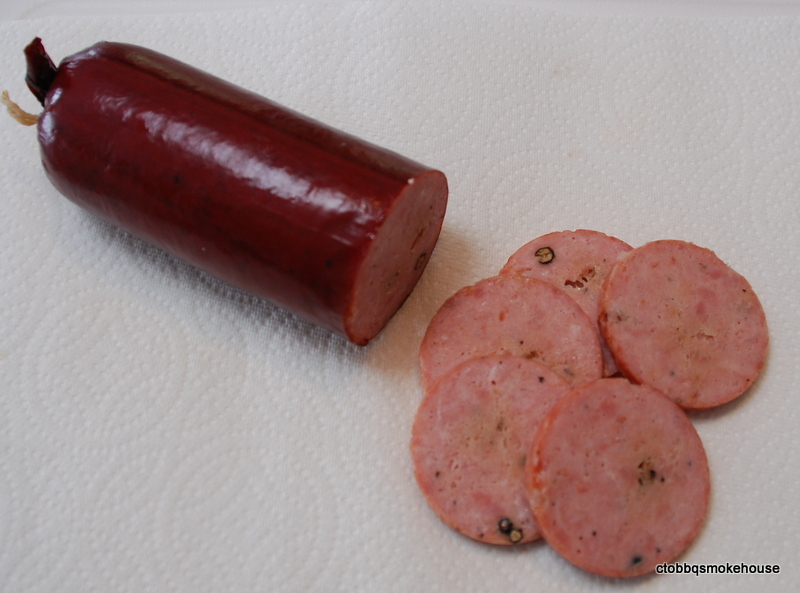 It is a semi-dry cured salami that is smoked after it is allowed to cure to develop a natural tang. It is very popular with hunters who use venison & elk meat and this recipe works very well substituting wild game meat for the pork. I would however make sure that all fat is trimmed from the meat and add the bacon in this recipe or you can use pork back fat. I use pork and pork back fat in my traditional recipe. Today I am using bacon ends instead of the pork fat to give it a little change of flavor. 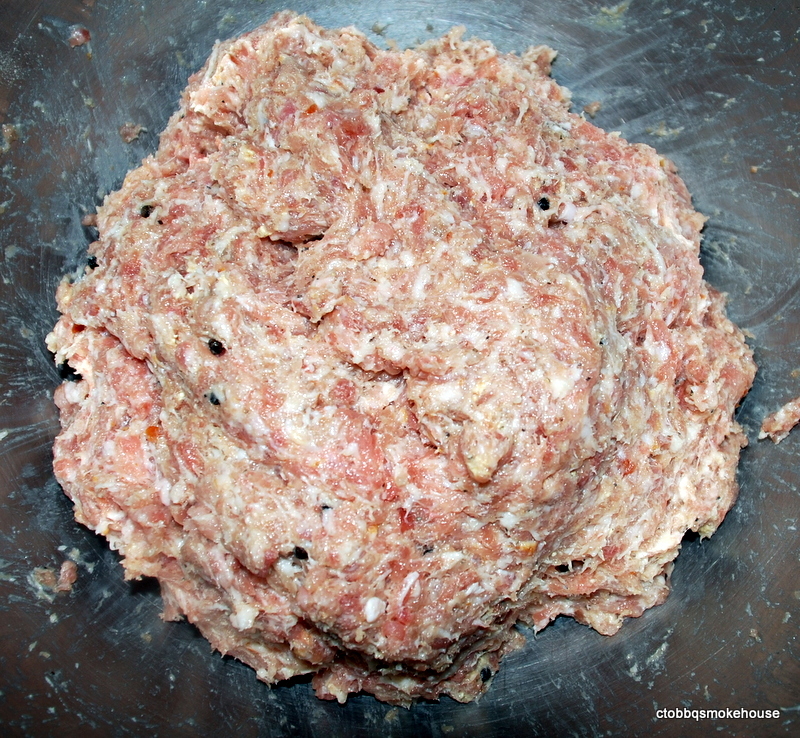 Grind the partially frozen meat and fat using a 3/8 grinding plate. 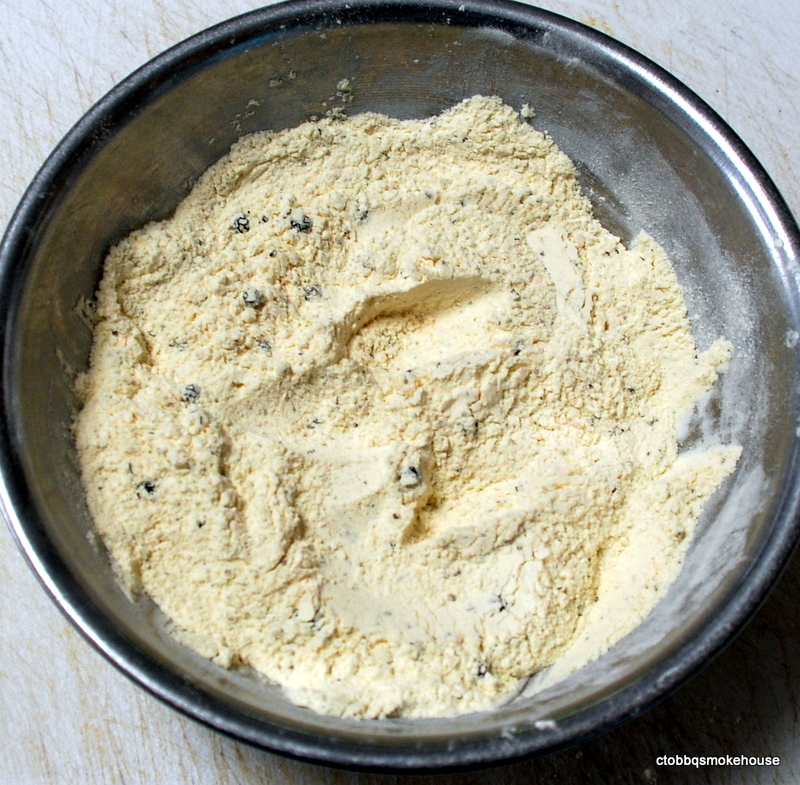 Mix in dry ingredients and mix thoroughly. Place in a ziplock bag and pack tightly removing all air and sealing. Put in the refrigerator and let cure for 4 days. To make it easier to regrind the meat, I form little pieces that easily feed down the grinding tube. Grind and stuff the casings using a large grinding plate as the whole peppercorns need to pass through. 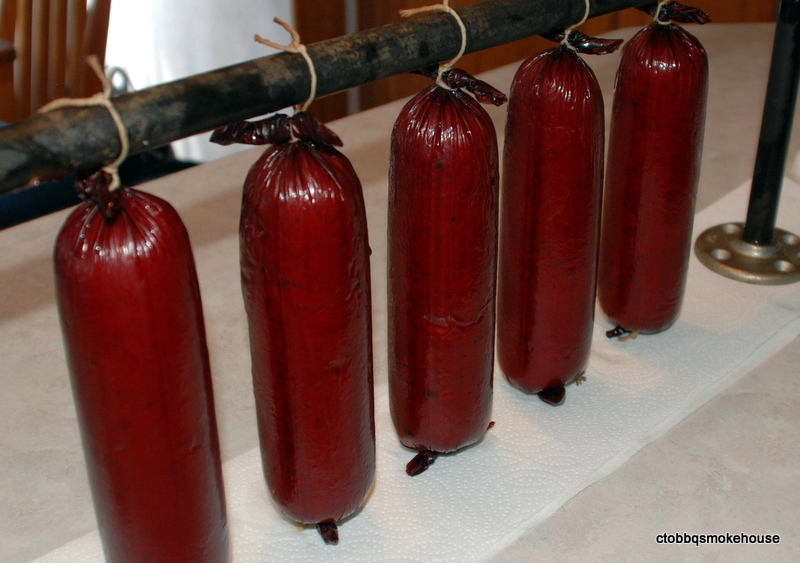 Hang salami on a smoke rack and let cure @ room temperature for 12 hours. Insert a temperature probe into one of the salamis and place in smoker @ 110 degrees. 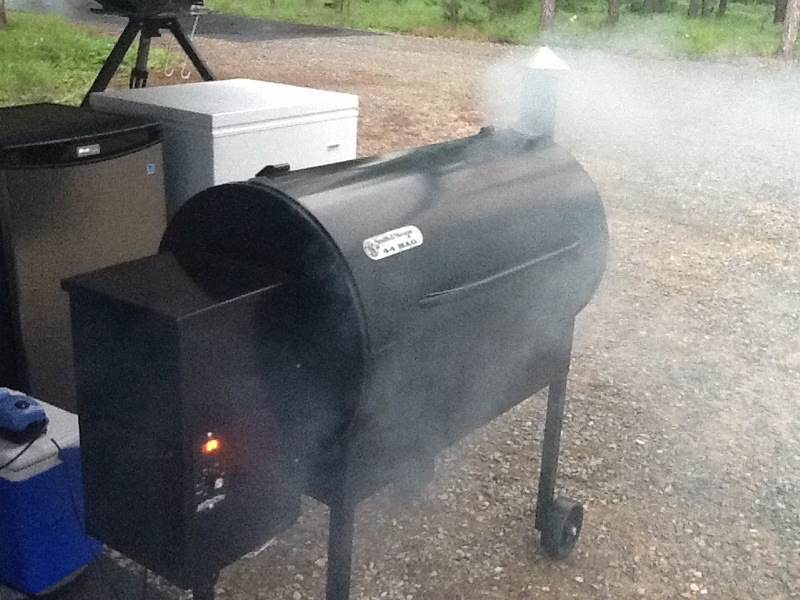 When the internal temp reaches that, raise smoker temp to 125 degrees. When that temp is reached, raise smoker temp to 155. The salami is done when 155 degrees is reached. 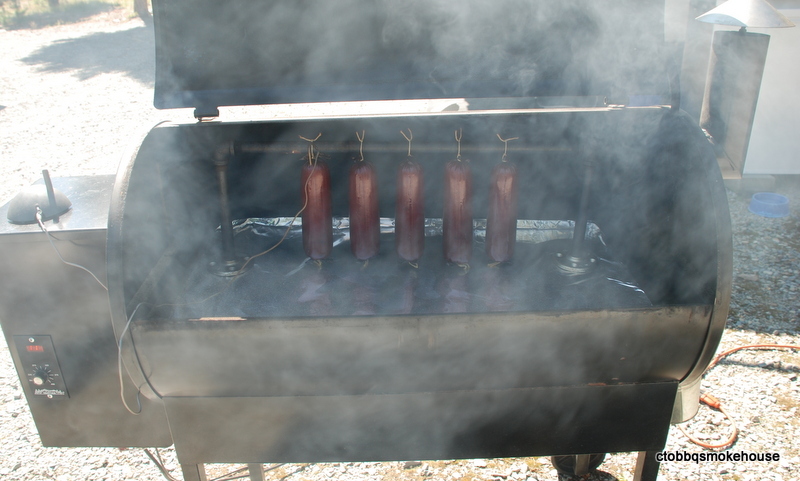 Remove salami still on the smoke rack and shower with cold water until the internal temp reaches 110 degrees. Gently wipe the salami with paper towels. 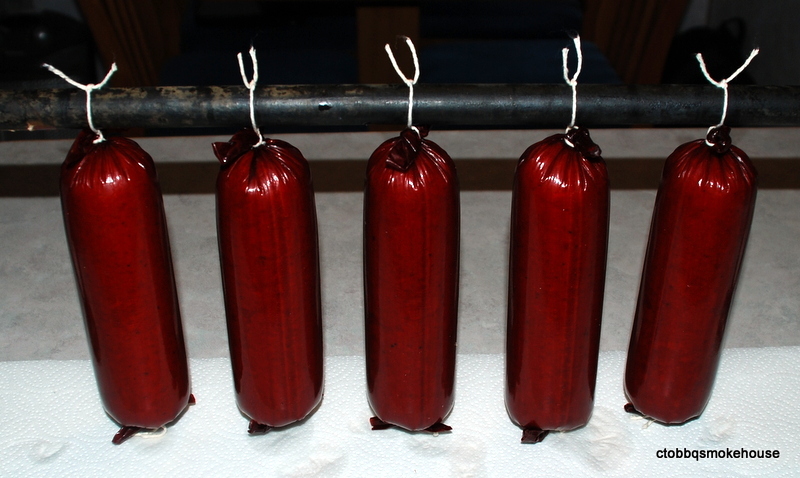 Let hang on smoke rack @ room temp for three hours to allow the salami to bloom. Store refrigerated. I like to vacuum pack what I’m not going to eat right away and place in the freezer. They won’t lose any flavor for up to 90 days. Cube pork, bacon & partially freeze. Grind with 3/8 grinding plate. Add the rest of the ingredients and mix thoroughly. 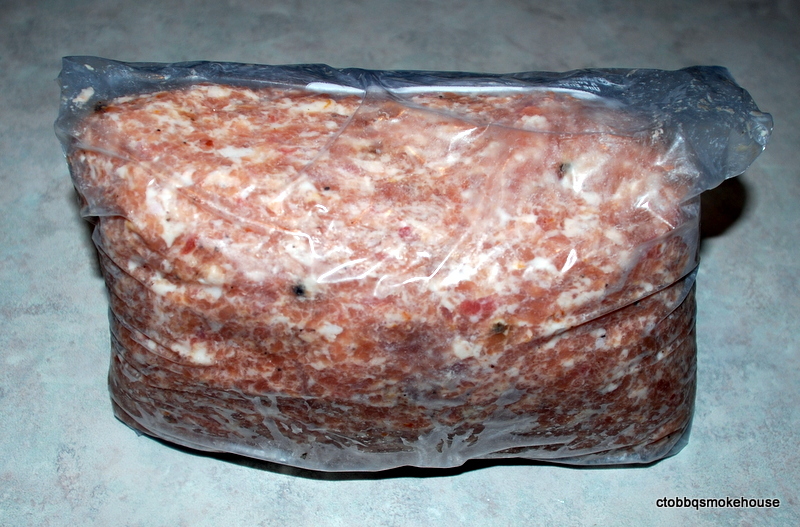 Place in ziplock bag and let cure refrigerated 4 days. Regrind using a large grinding plate and stuff into casings. Hang at room temp for 12 hours. 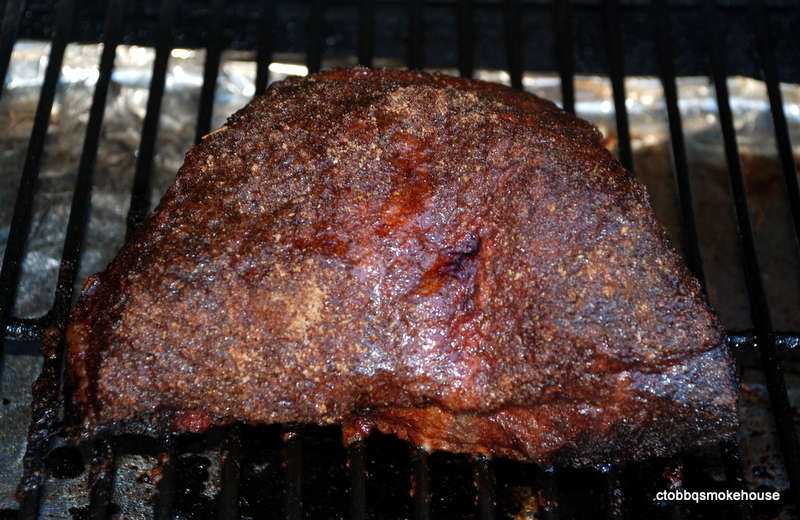 Smoke @ 110 degrees several hours then raise the temp to 125 degrees for about and hour. 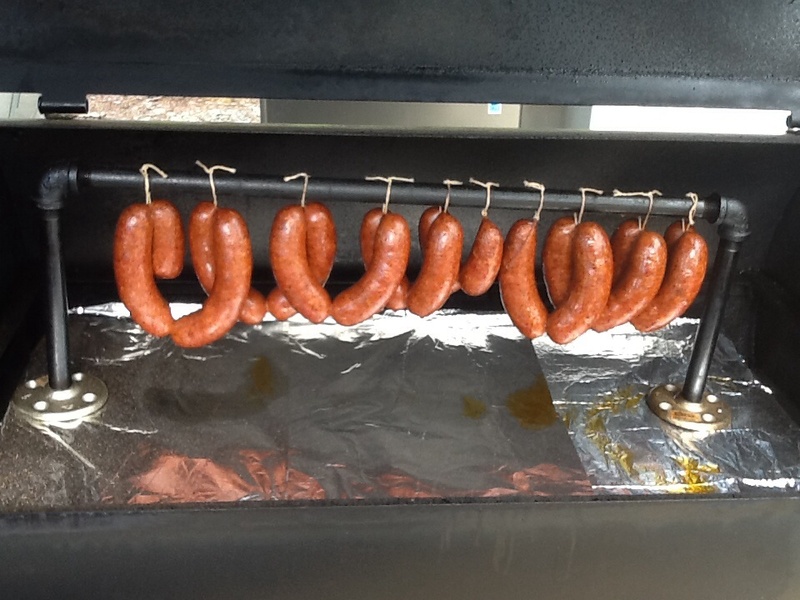 Raise temp to 155 degrees and salami is done when the internal temp is 155 degrees. DO NOT ALLOW THE SMOKER TO GET ABOCE 160 DEGREES OR THE FAT WILL START TO SEPERATE. Remove from smoker immediately and shower with cold water until the internal temp reaches 110 degrees. Hang @ room temp to allow salami to bloom. 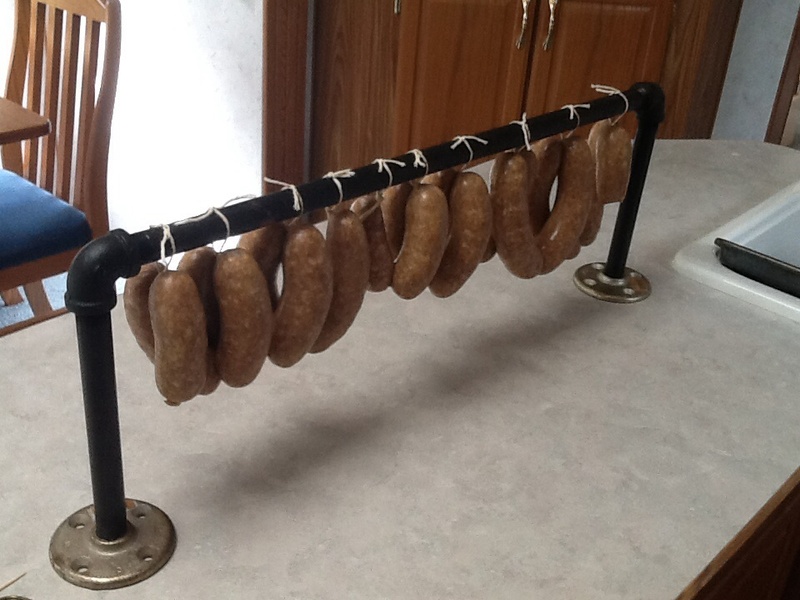 This entry was posted in Salami, Smoked and tagged Summer Salami, Thuringer. 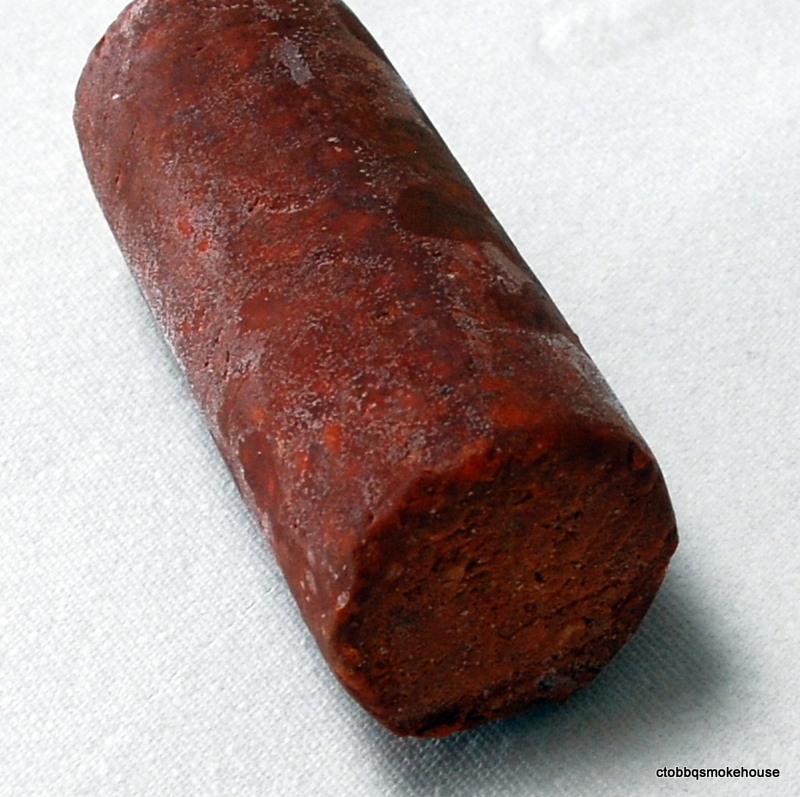 Nduja, pronounced “en-doo-ya” is a soft salami, dry cured, from Calabria, Italy. Up until recently it was not available for purchase in the United States. 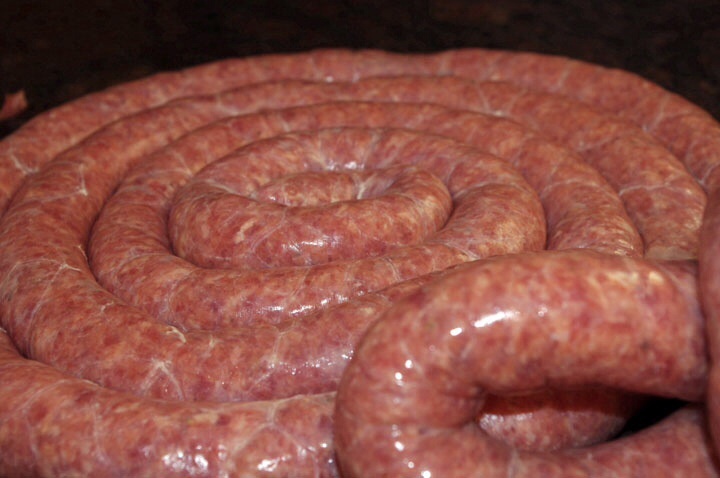 It couldn’t be imported because the salami was made with not only pork, but pork lungs. I know that sounds awful but if you go to your supermarket and look at the Mexican chorizo in the refrigerated section right next to the hot dogs and other packaged meats, you will find that it not only lists its ingredients as pork, but lymph nodes and salivary glands. YUCK!! Anyway, people who traveled to Italy and experienced this spicy hot Calabrian salami wanted to be able to have it here in the US. One such group of Chefs happen to own the Purple Pig restaurant in Chicago. They produce their own Nduja and serve a killer Pork Blade Steak topped with Nduja and honey. Bon Appetit published a story in 2010 about the Purple Pig and gave the recipe for the Blade steak. That got me interested in finding a recipe and making it for my own use. I found a great recipe by Len Poli, an expert in Charcuterie. That is the recipe I am using with the exception of adding Bactoferm T-SPX as a culture which most people are using now, and using smoked paprika instead of sweet paprika, bypassing the need to cold smoke for hours. For 5 lbs. 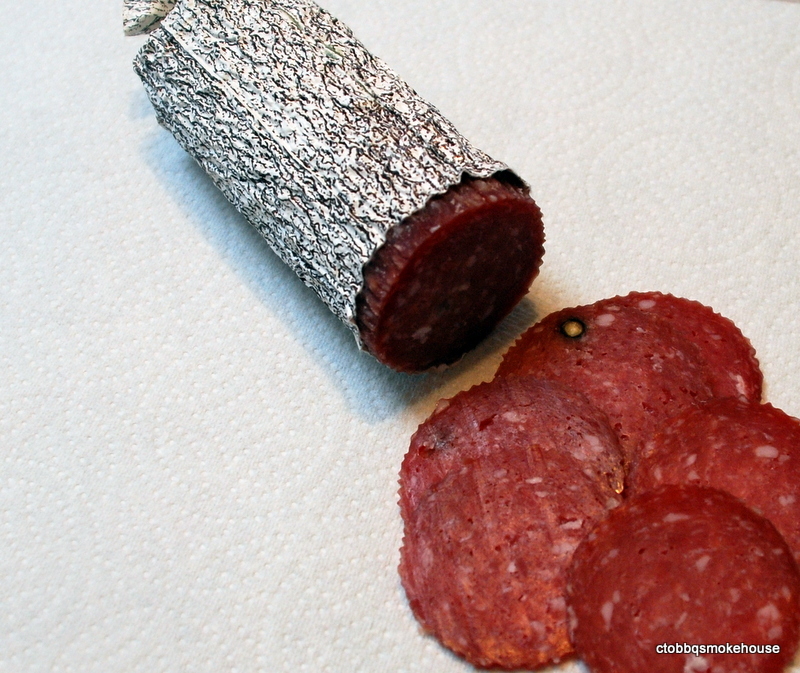 salami. 2 1/2 lbs pork shoulder. 2 1/2 lbs. pork back fat. 2 cups Calabrian hot pepper powder. 1 1/3 cup smoked paprika. 3 Tbs. Kosher salt. 1 tsp. Instacure #2. 1/4 tsp. Bactoferm T-SPX dissolved in 1/4 cup distilled water. Cube meat and back fat and partially freeze. Place Bactoferm in the water and let sit for 30 minutes to activate. Grind meat using a 3/8 plate. Add the spices and mix well. Pour water with Bactoferm into the meat and mix again. Stuff meat mixture into protein lined casings. Let ferment at 68 degrees for 48 hours. Cure in curing box @ 54-60 degrees and relative humidity of 75% for 4 weeks. If you get a formation of mold on the casing don’t worry. It is good mold. 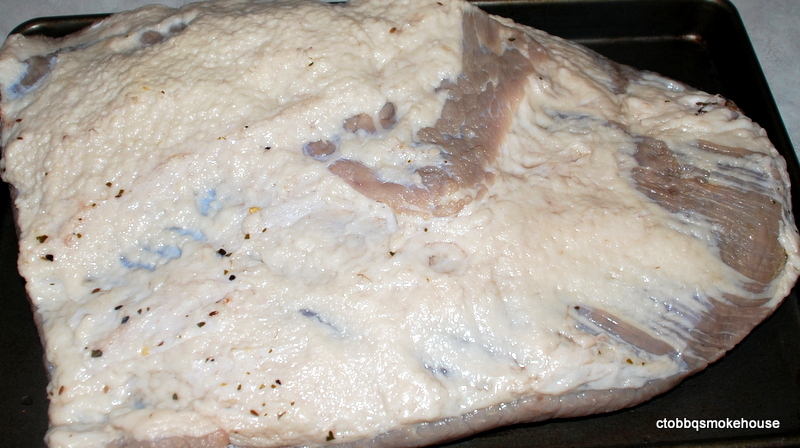 However, if you wish, mix equal parts water and vinegar and wipe off the mold with a paper towel. This isn’t necessary but your curing chamber might smell better. Now, the Calabrians like to put a little olive oil on crusty bread and top with thin slices of Nduja. For me that is a little spicy, but good. Here is the recipe for the Purple Pigs Pork Blade Steak with Nduja. 4 blade steaks. 4 ozs. thin sliced Nduja salami. 2 Tbs. honey. Lightly coat blade steaks with olive oil. Season with kosher salt and coarse black pepper. Sear steaks on griddle or cast iron pan for 3 minutes. Turn steaks over and top evenly with Nduja. Salami will soften. Sear another 3 minutes. Place steaks Nduja side down on plates and drizzle honey over each. Serve with arugula salad. This entry was posted in Charcuterie, Dry Cured, Pork, Salami. 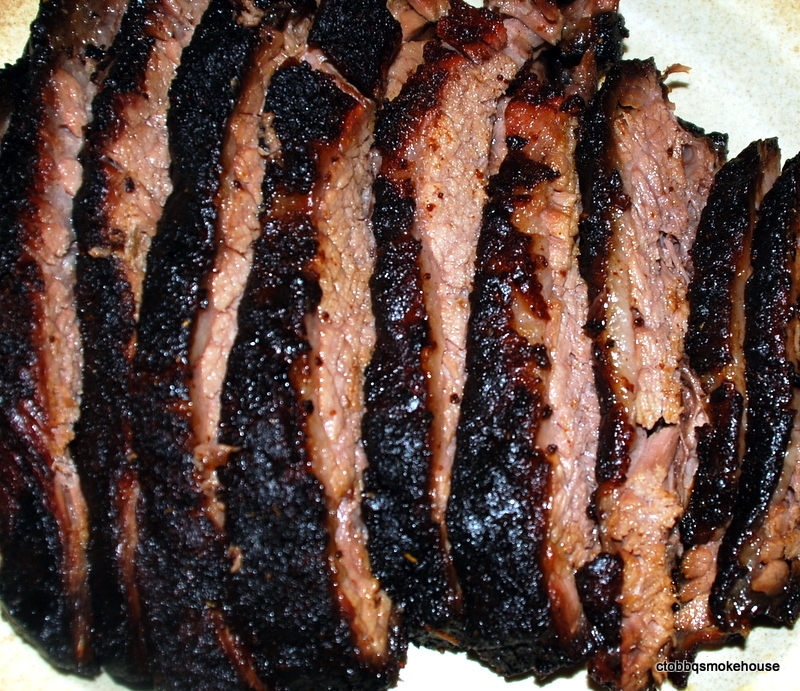 When smoking a beef brisket I usually use a “full packer Brisket”. This has two distinct cuts, the point and the flat. They are separated by a thick layer of fat. 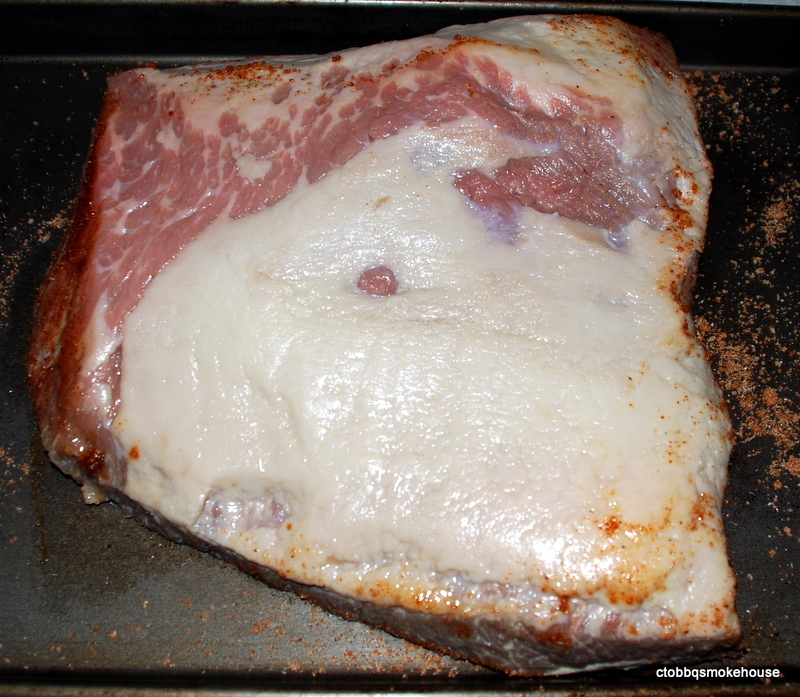 The point is the thick cut on top, with the flat being on the bottom. The picture above is the flat. You can separate these two cuts by cutting through the fat layer being careful to leave about 1/4 inch of fat on the top of the flat. I use the point to make my burnt ends and the flat for slicing. Today I am smoking just the flat since I am preparing BBQ for just me and my wife. There will be plenty of leftovers since a flat is around 5-7 lbs. raw and will lose about 30 % of weight when finished. That will leave about 3 1/2 – 5 lbs. finished meat. The first step is to prepare a marinade and inject to meat. I use equal amounts beef broth, cider vinegar, and olive oil. I emulsify them in a blender until smooth. For this brisket I used 2/3 cups each. Inject the meat along the grain every inch or so. Be careful because this is a coarse grained cut and the marinade will squirt out in all kinds of places and ruin your shirt! Place the meat in a large ziplock bag and add the rest of the marinade. Place in the fridge for at least 24 hours. 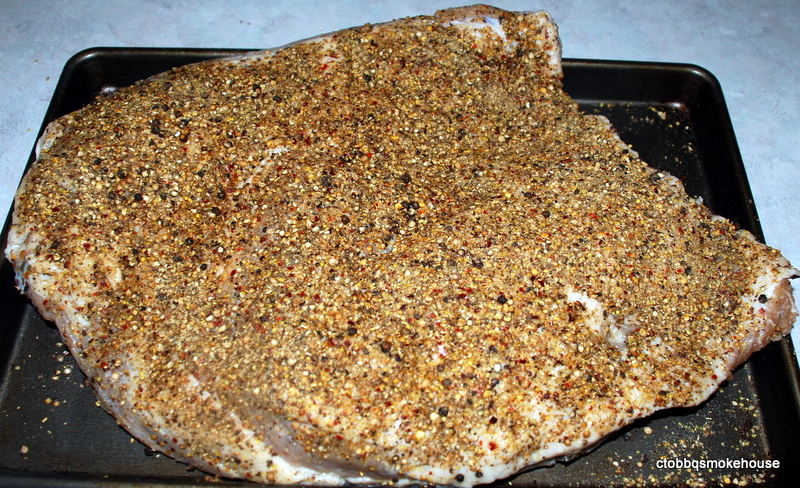 When you are ready to smoke the brisket, remove from the marinade and pat dry. 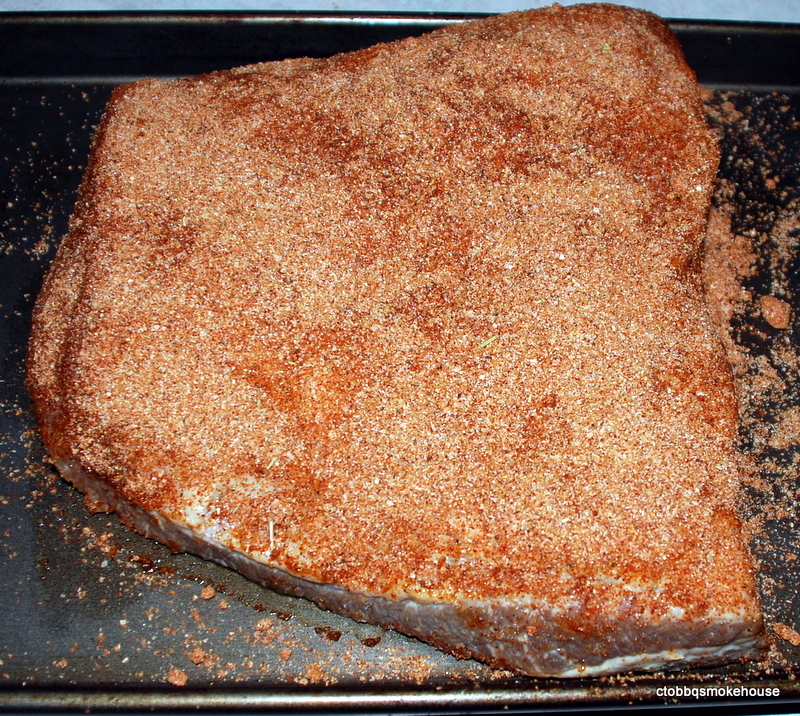 Apply your favorite rub (or you can use my “Basic Rub Recipe” found on this blog) on the top, bottom, and sides of the meat. Place in a smoker @ 225 degrees and smoke for 6 hours. At the end of 6 hours it will look like this. 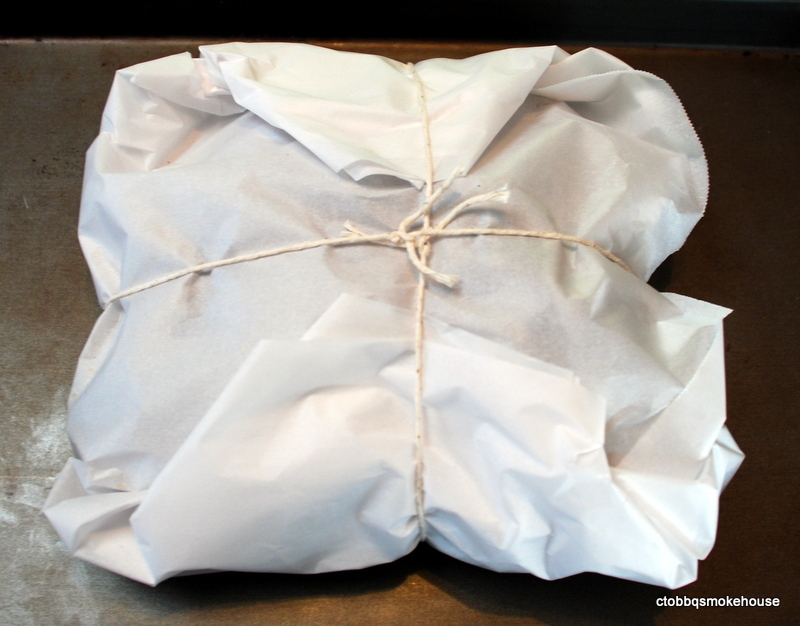 I remove the brisket from the smoker and wrap in unwaxed butcher paper and tie with kitchen twine. You can use heavy duty foil if you want but I find that using butcher paper the meat retains the moisture whereas the foil causes a lot of the juices to come out of the meat leaving a considerable amount in the bottom of the foil. There is none in the paper. 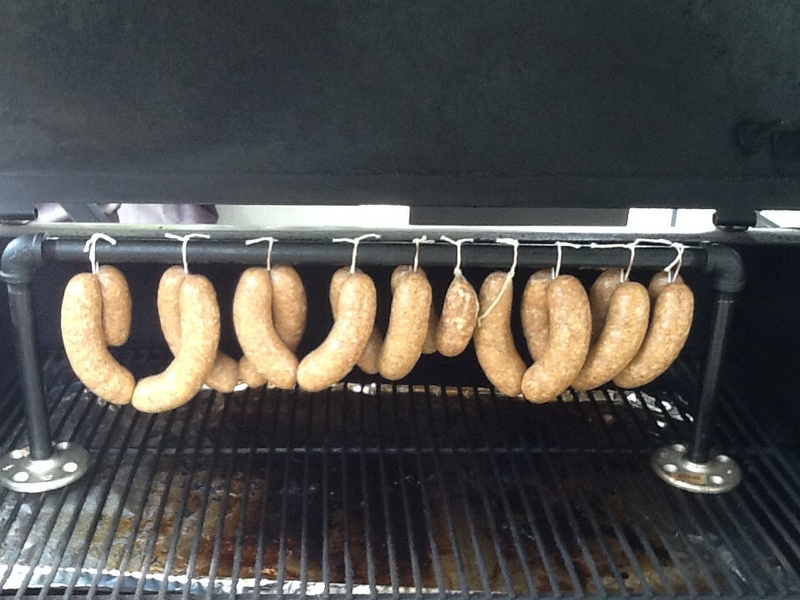 The smoking process is done but the cooking process is not. 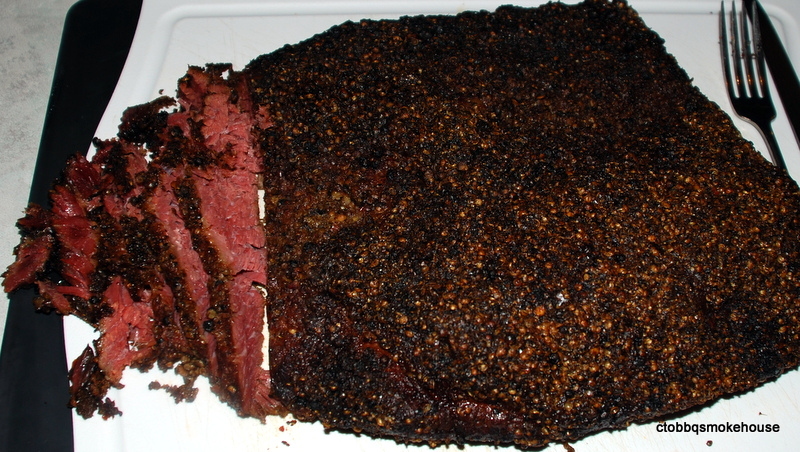 You can place the wrapped brisket back in the smoker or place in an oven @ 225 degrees for another 3 hours. I recommend the oven to save on smoker fuel. This is what makes it all worthwhile. It is smokey and melts in your mouth. NO KNIVES NEEDED! This entry was posted in Uncategorized and tagged Barbecue, Beef.